Air travel in India has soared in the past five years as almost a dozen new airlines have been launched to serve demand in the fast-expanding economy. 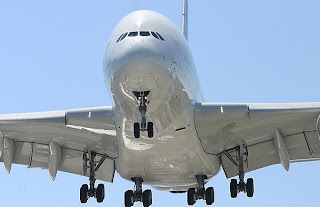 Very interesting day in the Indian Aviation history – On Sunday, May 6th 2007 the world's largest passenger aircraft Airbus A380 powered by four Rolls-Royce Trent 900 engines, landed at the Capital's Indira Gandhi International Airport at around 10.45 am for the first time in India. The Airbus A380, which has been generating enormous interest around the globe and the aviation industry and is regarded as the future of aviation, has come in the run up to the Kingfisher Airlines second anniversary celebrations. Kingfisher Airlines which completes two immensely successful years of operations on May 9 is the first and the only airline from India to sign up for the Airbus A380 and has 10 aircraft on order with five firm orders and further options for five more aircraft. The first delivery is expected in 2011. 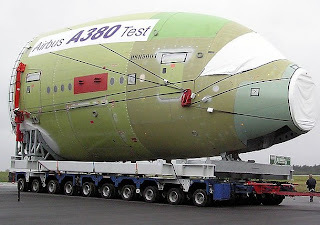 Here is some info on Airbus A 380: this is the world's largest airliner, easily eclipsing Boeing's 747. It's the largest passenger jet ever built -- so huge that airports have to be redesigned to accommodate it. It can pack in more passengers and cargo than any other commercial airliner, yet its designers claim it will actually increase efficiency, use less fuel and generate less noise. Airbus has spent an estimated $13 billion on the development of the A380. The price for a single plane is listed at $285 million. Courtesy : How stuff works. 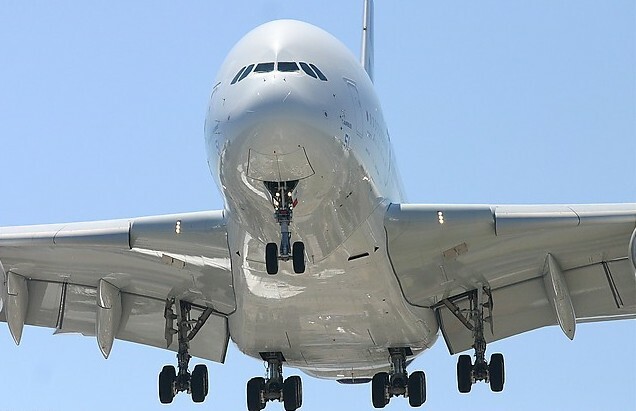 A380-800 - Operating empty 275,000kg (606,000lb), max takeoff 548,000kg (1,208,000lb). A380-800HGW - Max takeoff 560,000kg (1,235,000lb). A380-800 - Max cruising speed M 0.88. Long range cruising speed M 0.85. Range 15,100km (8,150nm). Service ceiling FL430. A380-800HGW - same. A380-800 - Four 302kN (67,890lb) thrust class Rolls-Royce Trent 900 or Engine Alliance (General Electric-Pratt & Whitney) GP-7200 turbofans. 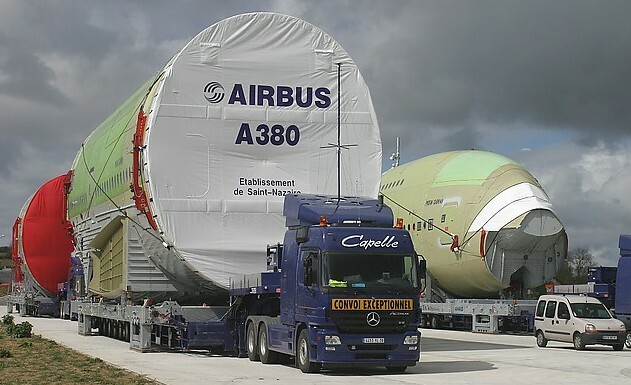 A380-800HGW - Four 311kN (69,915lb) Trent 900s or GP-7200s. 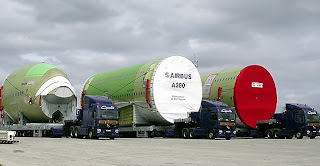 In a first step, the front and rear sections of the fuselage are loaded on an Airbus RORO ship, in Hamburg, northern Germany, whence they are shipped to the United Kingdom. There the huge wings, which are manufactured at Filton in Bristol and Broughton in north Wales, are transported by barge to Mostyn docks, where the ship adds them to its cargo. 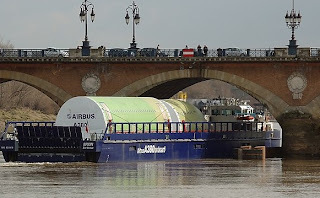 In Saint-Nazaire, western France, the ship trades the fuselage sections from Hamburg for larger, assembled sections, some of which include the nose. The ship unloads in Bordeaux. 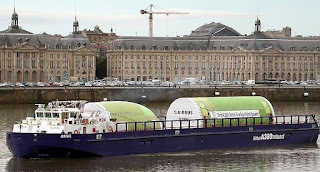 Afterwards, the ship picks up the belly and tail sections in Cadiz, southern Spain, and delivers them to Bordeaux. 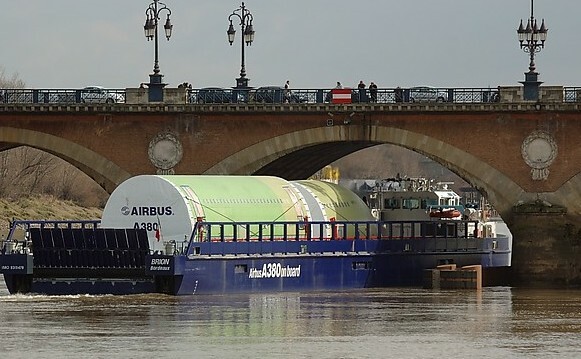 From there, the A380 parts are transported by barge to Langon, and by road to Toulouse, where the A380s are assembled before being flown to Hamburg to be furnished and painted. Circulated to my group on 7/5/2007 and posted in my blog now.